courtesy of Burns Pet Nutrition Ltd.
WarkSAR are one of 36 Lowland Rescue teams spread across the country. We are primarily a foot team (we search on foot, not from horseback; bike or quad and we don’t currently have drones) with sub-groups of dogs and kayaks. We have only a few dogs, all of them trainees at the moment – three of them are sponsored by Burns Pet Nutrition Ltd – and we train them regularly, usually at least twice a week, at different locations around the county. 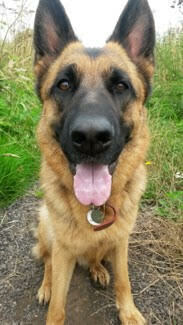 You can read a little bit about each of our dogs on the Search Dogs page. Three of our dogs are scent-specific trailing dogs – this means they follow a scent trail from an item (scent article) worn or handled by the person hiding (Dogsbody) for up to 1.5 km. The trail can be freshly laid for beginner dogs or several hours old for the more advanced dogs and can be on soft surfaces, such as grass or in woodland, or on hard surfaces such as pavement in towns, or any combination of these. Last week we were out and about at one of our training sessions and were joined by a dog/handler pair from a nearby team. We had a very successful evening, working our trailing dogs. Merry is our most advanced trainee dog and is getting closer to assessment every day. She had a difficult start to her trail: A choice of 4 different paths to follow with a steady breeze pushing the scent into all 4 of them. It took her a few minutes but she worked out the problem and then was very accurate in following the remainder of the trail at a fast pace. V worked her socks off on a challenging trail across open areas in parkland, with a series of turns, and passed her next stage evaluation. She also gave a text book example of what to do with a “starburst” scent discrimination test. This is when 5-7 people stand together for several minutes, forming a pool of scent. One of them drops a scent article and then all disperse, like the spokes of a wheel, for 50 – 150m and hide out of sight. The dog is brought to the scent article, encouraged to sniff it, then has to work out which of the trails leading away from the scent pool belongs to the person who left the scent article and follow that trail to the person’s location. I have never seen this performed faster or with as little hesitation. BANG. Very well done V.
Our guest dog worked in the dark for the very first time and also had a first go at the starburst. She has only ever had 1 trail leading away from the scent article before so 6 trails was a little confusing for her. She identified each trail leading away from the starting point but needed a little encouragement to follow the appropriate one. A yummy reward following the find will help her make the correct decision herself next time. Our next training session should have been at the weekend but the whole team had a big fundraising event on so there wasn’t anyone spare to hide for the dogs to find. As a charity we have to raise all our funds ourselves. Our projected running costs for this year are close to £11,000 plus another £4000 to buy uniform for the trainee members who are currently close to becoming operational. A recent intake of 21 probationers means that we will soon be looking for even more money for uniform. Add on our big wishlist items eg: medical gases, Oxygen and Entonox, for our Lowland Rescue First Responder kit; a second LRFR kit, complete with AED (defibrillator) and gases for our new second vehicle; better stretchers; and other important items. You can see why fundraising is very important to us and why it must take priority over training.